Introduction to Kinesiology: Studying Physical Activity, Fourth Edition With Web Resource, is the most cohesive introduction to the field of kinesiology available, demonstrating how its many disciplines integrate into a unified body of knowledge. This all-inclusive approach gives students a solid background in the field and prepares them for further study and course work. This engaging and jargon-free text also introduces students to job prospects and areas of study and professional practice in kinesiology. 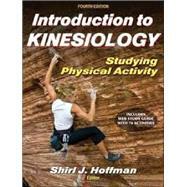 Introduction to Kinesiology, Fourth Edition,orients and prepares students for in-depth studies in their areas of interest. Its broad scope acknowledges students' diverse interests and aspirations in professional and scholarly career tracks as well as teaching and coaching. Top kinesiologists expand discussion of physical activity beyond exercise, sport, or health-related activity in an effort to broaden conceptions of physical activity and the potential contributions of kinesiology. The contributors, each with specific expertise in the subdisciplines, share their perspectives in chapters complemented by full-color photos and illustrations. Students can enrich their learning experience by taking advantage of the following tools and features: Chapter objectives help students keep the main ideas in mind as they read through the text, and summaries at the end of each chapter reinforce these concepts. Key points highlighted throughout each chapter stimulate interest and supplement information in the text. Study questions at the end of each chapter help students focus on key areas of the text. A fully integrated web study guide helps students explore and comprehend concepts presented in the text. Callouts in the text (or links in the e-book) direct students to interactive activities, such as scenario-based activities, drag-and-drop, selecting from a menu, or responding with short answers to photos and scenarios presented. New and unique sidebars in the web study guide detail the major goals of each of the subdisciplines, provide case studies of real-world careers, and offer examples and applications to promote critical thinking. Practical Plug-In activities in part II help readers experience how content knowledge of the subdisciplines leads to real solutions. Part III features the addition of A Day in the Life profiles, drawing additional attention to the work of professionals in the field. Additional study questions, review of key points, activity feedback, interviews with practicing professionals, and web search activities further stimulate interest. The fourth edition maintains its clear organization into three parts but with a streamlined format and increased emphasis on studying the field as a whole. A recurring diagram in each section visually displays the integration of experience, scholarly study, and professional practice and seeks to balance the importance of these unique and interrelated dimensions of the discipline. The first section of the text provides broad discussion of how physical activity experiences in sport, exercise, work, rehabilitation, and daily living contribute to the understanding of kinesiology and how kinesiologists design and apply physical activity experiences. Students are then introduced to the academic subdisciplines of kinesiology. Job descriptions of professionals in each subdiscipline educate students on careers available, and practical applications illustrate the importance of the subdiscipline and how it may relate or contribute to a variety of professional endeavors. In the final section, students will examine the responsibilities and requirements of professionals in health and fitness, therapeutic exercise, teaching, coaching, and sport management. Work setting analyses, educational qualifications, case studies, profiles of working professionals, and career advice help students determine their professional interests and direction. The fourth edition of Introduction to Kinesiologyremains the leading text for orienting students to the discipline of kinesiology and its diverse professions. With its full-color format and engaging writing style, Introduction to Kinesiology, Fourth Edition, presents the unified discipline of kinesiology and the variety, complexity, elegance, and importance of physical activity.